Why do we need chromosomes? Most cells in our bodies contain 46 separate long DNA strings that spend most of their time in what appears to be a tangled mess – in a sort of round shape we know as the nucleus. 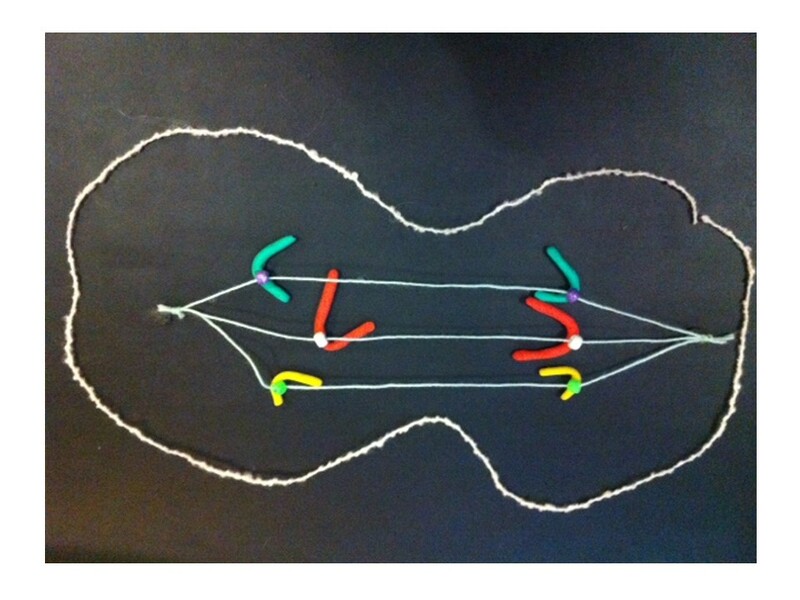 Then lo and behold, these long strings fold up and become chromosomes. Why do they do that? Bill Earnshaw’s lab at Edinburgh University does some amazing work with chromosomes and cell division. He can explain very elegantly why we need chromosomes. 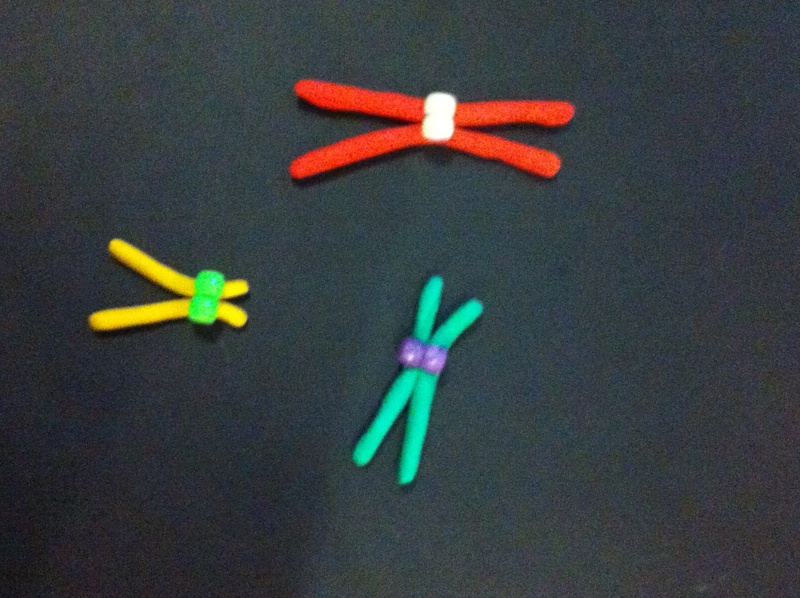 Here are some photos from the Earnshaw lab of the chromosomes during cell division. 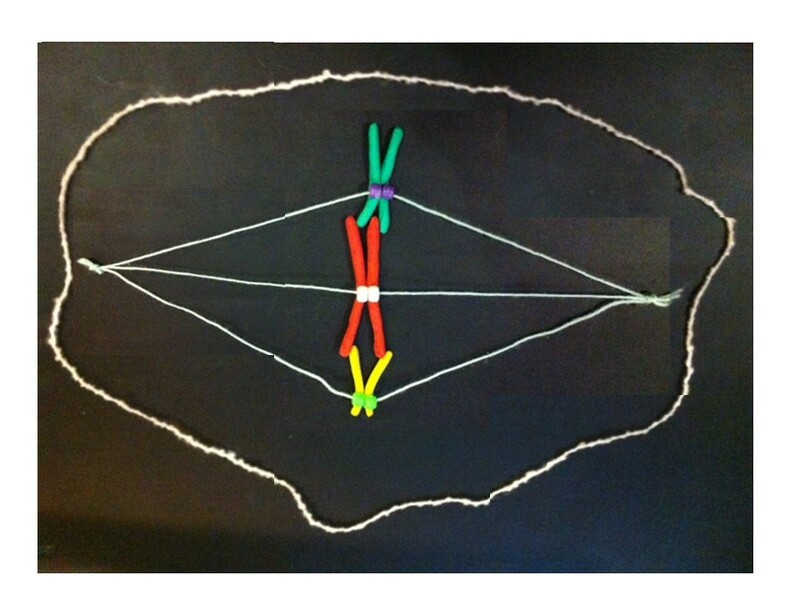 The photo above shows the blue chromosome halves (after the doubled-up chromosomes have split in two) separating along the green spindle fibres (this stage is “anaphase”). Each set of chromosomes will belong to one of the two new daughter cells. If this happens correctly both new cells have identical sets of DNA. This whole cycle of chromosome growth and division is called “mitosis”. DNA carries genes that make up the blueprint that’s responsible for making every cell, every tissue, every organ work correctly. So it’s important we have the right set of genes. Cells divide a lot – millions of our cells divide every minute so it’s important that the DNA is shared precisely each time. Mistakes can cause the new daughter cells to misfunction. These cells can become cancerous or produce babies with genetic disease. Usually the cell watches out for these mistakes and self-destructs. But not always. Research helps us understand these processes, how they can go wrong, and work out ways to prevent or fix these mistakes. Cross-posted to Fireside Science at SciFund Challenge. Cancer has been described as the most common genetic disease. This doesn’t necessarily mean it’s hereditary – usually the genetic mistakes that cause cancer arise in the body’s organs or tissues and can’t be inherited. We’re continually learning of new cancer-causing genetic mistakes. If we think of genes as words spelling out the instructions for our bodies to function, there are different types of mistakes or “typos” that can cause cancer. Some of these are like spelling mistakes – an incorrect letter or two. The mistakes I’ll be talking about here involve whole words (or lots of them). For example one or more copies of a word are added – ” very big” becomes “very very big” – extra copies of a cancer gene (we call them oncogenes) can cause or accelerate cancer growth. Or if a word is lost – “don’t grow” becomes “grow” – this illustrates loss of a tumour suppressor gene. I described the breakage-fusion-bridge cycle a few weeks back. The BFB cycle was a theory developed from studies with maize, but it also applies to some cancers. This is an example of basic research, inspired by curiosity but eventually being useful in ways we never imagined. If you look back at that post it shows how the BFB cycle can cause gain or loss of genes. If a cancer gene is multiplied, or if a tumour suppressor gene is in the part that’s lost, the cell can gain a growth advantage over other cells, which is part of the process causing cancer. Cancer cell lines are cancer cells that can be grown indefinitely in the laboratory. I’ve just published a paper on HEL, which is a leukaemia cell line. It’s popular for studying how cells make globin (molecules in red blood cells that help us process the air we breathe). The chromosomes of HEL are very abnormal. I’ve used a combination of techniques to show how the chromosomes are reorganised as well as which parts have been lost, gained and amplified. It’s very complicated. One of the gene abnormalities in HEL is amplification of the JAK2 gene. JAK2 is a well-known cancer gene that is often abnormal in blood cancers. The normal gene can be mutated to become a cancer gene, for example by a “spelling mistake” in the DNA. By adding extra copies of this abnormal gene the effects can be magnified. This is known as gene amplification. There are a few cancer genes that are commonly amplified in cancers. To cut a long story short, JAK2 is amplified in the HEL cell line. And a nearby tumour suppressor gene (CDKN2A) has been lost. But only by looking at the chromosomes does the reason become clear. Some detective work tells us that there were some breakage-fusion-bridge events. I won’t go into the detail – if you’re interested it’s in the paper. But we have chromosomes whose ancestors had two centromeres, and if we use a DNA tag for the region between the centromeres we can see “stripes”. The red is DNA that’s normally at one end of some of the chromosomes. The stripes tell us that the end of a chromosome (22) is in the middle of these chromosomes and there are extra copies. It’s a strong clue that BFB cycles were involved and the ancestral chromosome had two centromeres. The new chromosome with four copies of the yellow gene courtesy of the breakage-fusion-bridge cycle. Recently JAK2 amplification was also reported in triple-negative breast cancer. Triple negative means that three well-known genetic causes of breast cancer are not present. So finding JAK2 amplification would help explain the cause of some triple-negative breast cancers, and could help work out an effective treatment. Perhaps this JAK2 amplification is sometimes caused by BFB cycles. 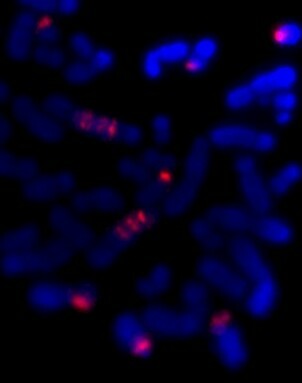 Without looking at the layout of the abnormal chromosomes we may never know. Telomeres. Apparently that’s the new buzz word in cosmetics . They come in different sizes – as we age they shorten. It’s been suggested that we could lengthen them to cancel the effects of ageing, or shorten them to cure cancer. But what are they? They’re an integral part of our chromosomes. The 46 long strings of genes in each human cell are folded up to form chromosomes, which we can see down the microscope. The telomeres are at both ends of each chromosome. They protect the ends of the chromosomes, and stop the chromosomes from sticking to each other. 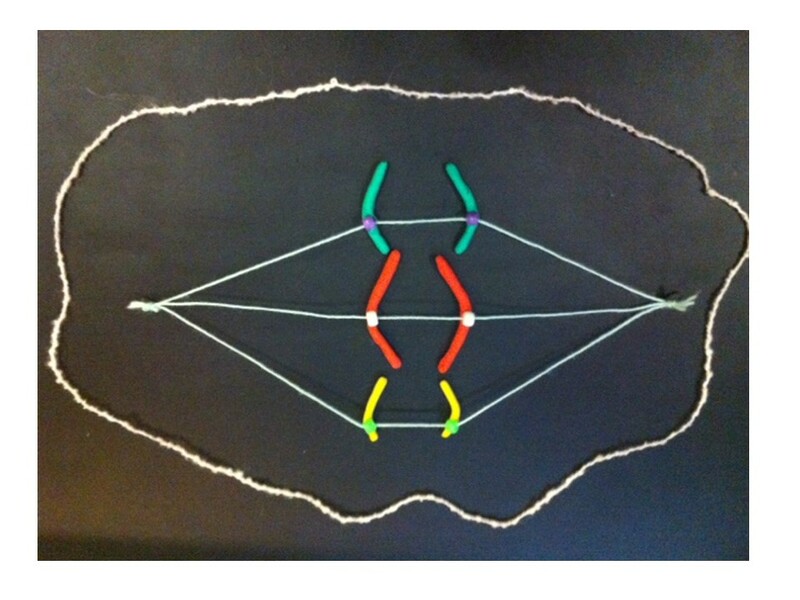 Chromosomes joining together can be a cause of cancer – more about how that works when we look at the promised breakage-fusion-bridge clay model (in stop motion hopefully!). 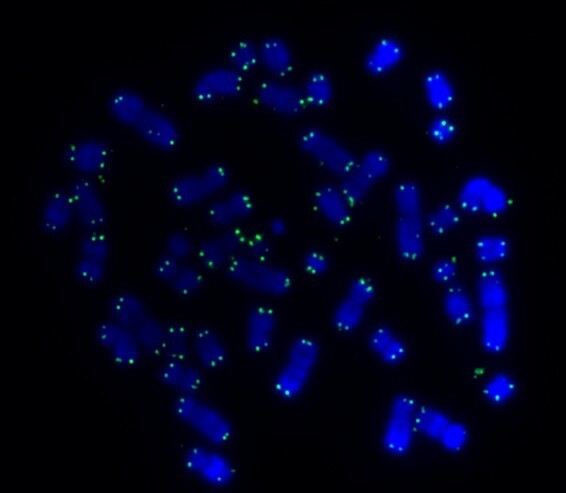 The green spots mark the telomeres on the chromosomes from a leukaemia cell. Spot the two abnormal “ring” chromosomes – no ends, no telomeres (answer next time). As we age our telomeres get shorter. Telomere shortening has also been associated with other factors such as extreme psychological stress and toxins, including chemotherapy. As well as cancer, short telomeres have been associated with diabetes, cardiovascular disease, osteoarthritis and other diseases. But it also seems that measures like reducing stress, improving diet and exercise may stop or even reverse this premature telomere shortening. Here’s the paradox – short telomeres can help trigger cancer, but once established the cancer switches on a telomere-lengthening mechanism (usually an enzyme called telomerase) to survive. And so different researchers are trying contrasting approaches to manipulating telomeres for improved health. On the one hand, some researchers are looking at the possibility of using the telomere-activating enzyme telomerase to reverse the effects of ageing. Some cosmetics are already available that contain a chemical that’s been reported to activate telomerase. This same chemical is being tested for use as a treatment for some diseases associated with ageing and short telomeres. On the other hand, because cancers need telomerase to be able to divide indefinitely, other researchers are looking into the possibility of destroying telomerase as a cancer treatment. These potential treatments will need extensive testing to see if they work and make sure they don’t have unwanted side effects. From the search for eternal youth to understanding and curing cancer, we haven’t heard the end of telomeres. A single fertilised egg cell becomes a mature human by growing and dividing into two, many times over. Each time a chromosome makes a copy of itself the telomeres lose a little bit off their ends. The older we get the shorter our telomeres become, so there’s a limited number of times a cell can divide. That is, unless an enzyme called telomerase is turned on. This enzyme lengthens the telomeres. If you think about it, although most cells in our bodies are programmed to divide a limited number of times, some cells have been dividing for millenia – germ cells – eggs and sperm. It’s cells like these that need telomerase. Most cancer cells are also able to divide indefinitely by switching on telomerase. Once the telomeres are dangerously short the chromosomes can start sticking together and becoming abnormal. This stage is called crisis. The cells don’t function properly, and are a cancer risk, and they stop dividing or self-destruct. There are “tumour suppressors” that look after this self-destruction, but occasionally a cell will bypass this (for example by having a mutated tumour suppressor gene), survive and divide. If the cells divide, these abnormal chromosomes can become more abnormal and turn on cancer genes or lose tumour suppressor genes. This process has mostly been studied in lab animals or cells grown in the laboratory in artificial conditions. So we can extrapolate and suggest that chromosomes with short telomeres can join together and cause cancer. Unfortunately chemotherapy is associated with shortened telomeres, and is a risk factor for leukaemia. These therapy-related leukaemias are usually marked by very abnormal chromosomes. In my own research I’ve identified some abnormal leukaemia chromosomes that have been made by chromosomes joining together at the telomeres. This was done by identifying which chromosomes are joined together, AND by looking at the molecular content of the chromosomes. End-to-end joining of the chromosomes is actually a lot more common than it’s thought, at least for the abnormal chromosomes I’ve looked at. The similarity between risk factors for very abnormal leukaemia chromosomes and shortened telomeres is interesting. One thing I’d like to do is find out how common this joining together of the chromosome ends is, in other types of abnormal chromosomes in leukaemia (AML), and eventually look at other cancers. It would help understand how these cancers are caused and possibly identify ways to prevent this. Other information from this type of study could identify more genes with a role in cancer. This opens up new possibilities for developing treatments. “Abnormal chromosomes made by the end-to-end joining of two chromosomes….” – that sounds like a segue into the breakage-fusion-bridge cycle. More on that later. E. Blackburn and E. Epel 2012. Too toxic to ignore. Nature 490:169-171 (about stress, disease and telomere shortening). Note, Elizabeth Blackburn is Australia’s only female Nobel Prize winner (in science at least) – she shared the prize for Physiology or Medicine in 2009 for her discovery of telomeres. E. Callaway 2010. Telomerase reverses ageing process. Dramatic rejuvenation of prematurely aged mice hints at potential therapy. Nature 28th November 2010 (published online). C. Harley et al 2011. A natural product telomerase activator as part of a health maintenance program. Rejuvenation Research 14:45-56. R. MacKinnon et al 2011. Unbalanced translocation of 20q in AML and MDS often involves interstitial rather than terminal deletion of 20q. Cancer Genetics 204:153-161. T. Morin. http://www.dayspamagazine.com/article/spa-products-tale-telomeres A balanced article on telomeres in Dayspa Magazine online. What makes a cell become cancerous? This can happen if the chromosomes are incorrectly distributed to a new cell. The cell could get too many copies of a cancer-promoting gene, or too few copies of a cancer-protecting gene. The breakage-fusion-bridge cycle is one way that this can happen. This week I was asked to provide a cartoon showing the breakage-fusion-bridge cycle and how it relates to a chromosome abnormality I was describing. By lucky coincidence my colleague Lan Ta just this week published a paper with a neat breakage-fusion-bridge cartoon that was put together by Bruce Mercer. As well as being a scientist, Bruce is a graphic artist – a very handy combination. So I was trying to draw the modified cartoon for Bruce in two dimensions, without much success. Then modelling clay came to the rescue and I was able to show him what I meant. 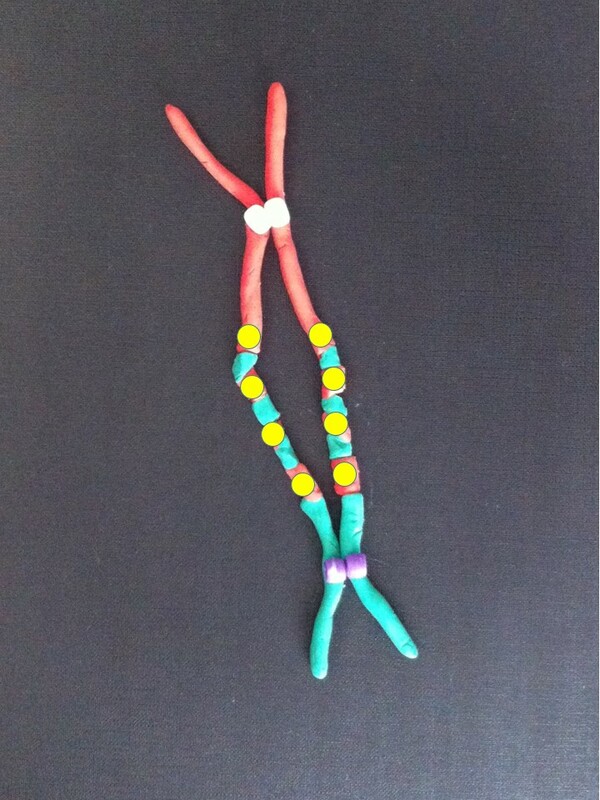 So I would like to share the 3D modelling clay version, but before we look at the breakage-fusion-bridge cycle, which is an abnormal pattern of chromosome division, we had better look at normal chromosome division (or mitosis). 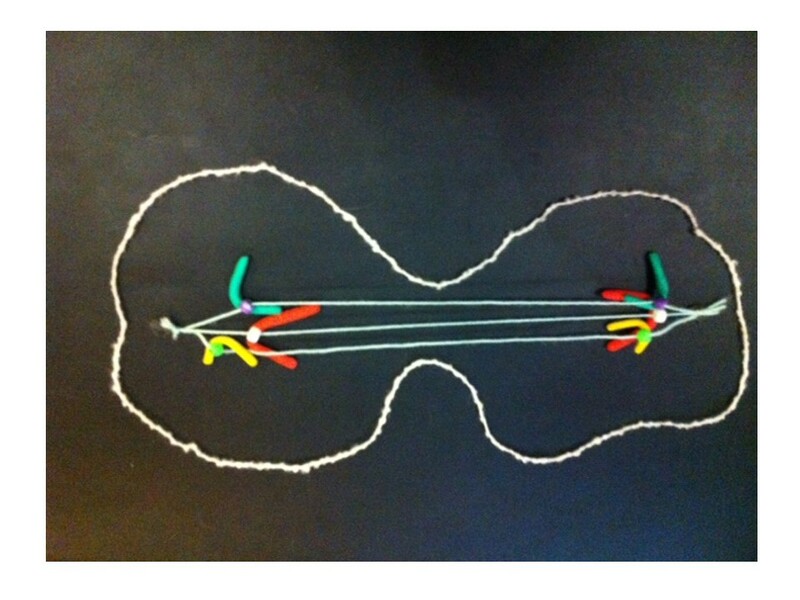 These are chromosomes in modelling clay. There are 23 pairs of chromosomes in a human cell but we will follow 3 chromosomes for simplicity. The chromosomes only take on a recognisable shape when the cell is ready to divide. Each chromosome is made of two halves called chromatids, which are identical. These are held together at the centromere. In a cell the chromosomes are usually not recognisable – the DNA is unravelled in the nucleus. In a growing cell each unravelled chromosome is producing a copy of itself so that there will be a chromosome for each of the two new daughter cells when the cell divides, or reproduces itself. After the chromosomes take shape they line up together (at the metaphase plate) between two ends, or poles, of the cell. 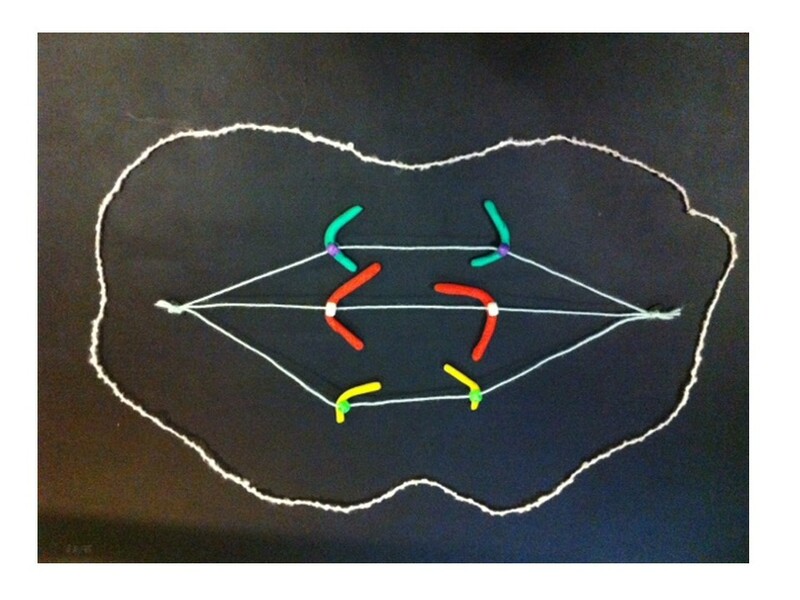 The centromere has another very important function in cell division. 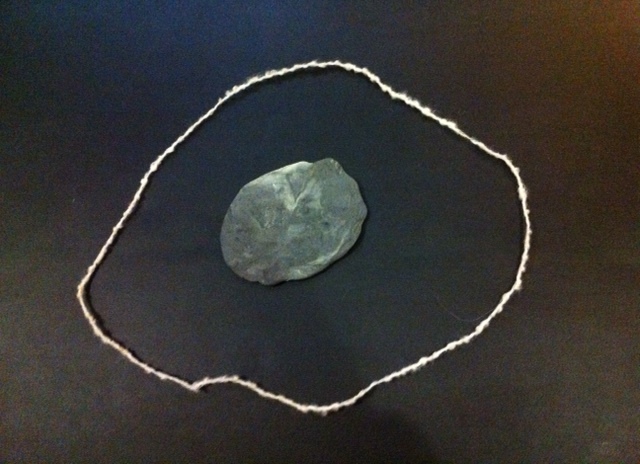 It attaches to fine fibres (microtubules) which stretch between the poles. The two halves of the centromere separate and each draws its chromatid (which is now a new daughter chromosome) along these microtubules. 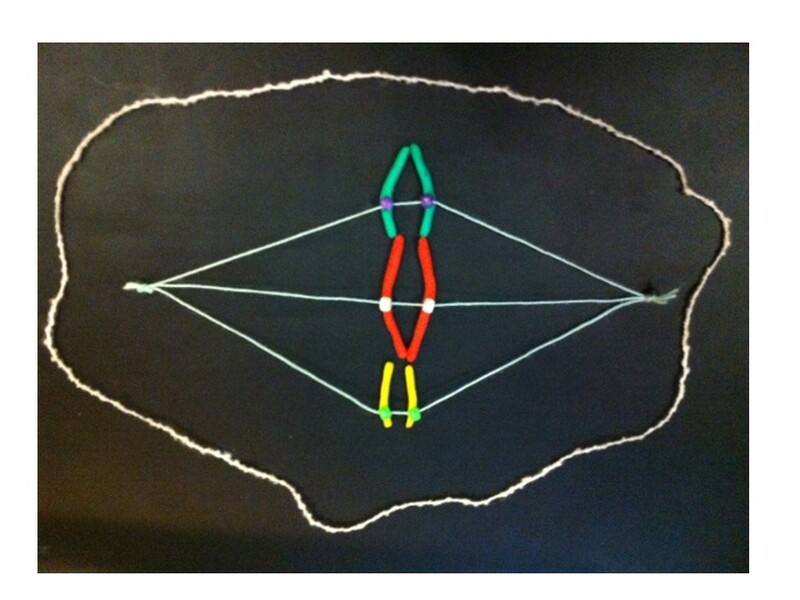 So when the cell divides in two to make two new cells, each chromatid becomes a chromosome in one of the new cells. 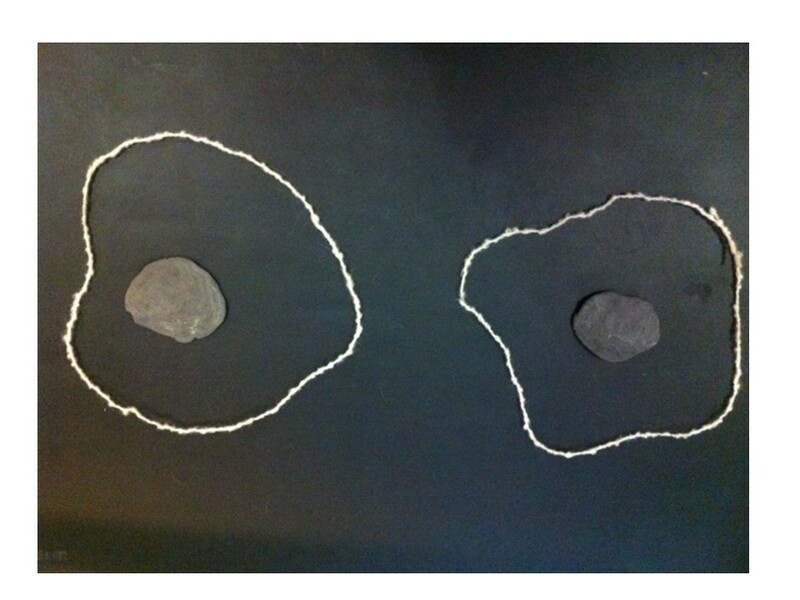 Cell division complete, the chromosomes unravel and copy themselves again ready for the next cell division. This process happens successfully millions of times every day to create new cells in our bodies – amazing. When it was initiated by the US Department of Energy in 1987, the Human Genome Project was an ambitious, some said impossible, endeavour. It was all about producing a representative readout of the human genome – that is, the whole set of human DNA. At the time DNA was read (sequenced) manually – scientists read each letter of the code off an X-ray film. One by one genes were laboriously found and sequenced. Finding and characterising a gene in this way was a whole PhD project, if you got lucky and actually found the gene (finding a gene by family studies was harder than starting with a known protein). Humans have some 3,000,000,000 letters (base pairs) in their genome, so a faster approach was needed to get the project finished in the planned 15 years. 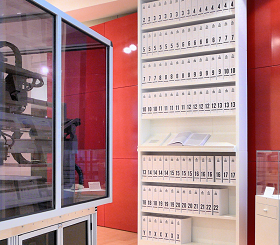 The Human Genome Project encouraged the development of much faster automated sequencing. I attended the 1991 Cold Spring Harbor Genome Mapping and Sequencing Meeting and there were several examples of exciting new automated sequencing prototypes, which used a range of different approaches. 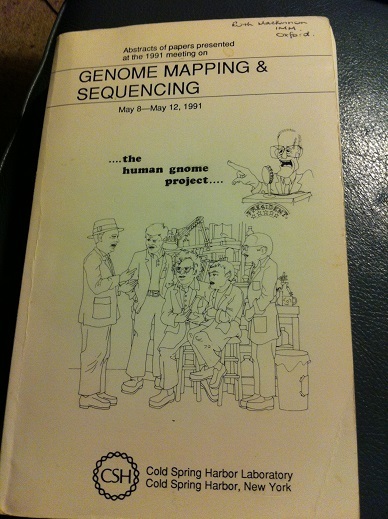 Abstract book from the 1991 Genome Mapping and Sequencing Cold Spring Harbor meeting. Now we can take it for granted that we can look up a gene on the internet. Having a human genome sequence was going to make a big contribution to health care. It is already helping, and will play a bigger role as we learn more about what roles the various genes play. For example working out what genes are playing a role in cancer will become more routine. We can already do a lot for some cancer patients by doing genetic tests on their cancer. There are many categories of leukaemia that have a very specific type of DNA abnormality, and knowing what gene is involved can help diagnose and treat the disease appropriately. Chromosome abnormalities helped make some of the earliest cancer gene discoveries. That’s because the gene abnormalities that cause some cancers are caused by microscopically visible changes to the chromosomes, which pinpoint the cancer gene. The poster child for this is chronic myeloid leukaemia. Most cases of CML have a chromosome abnormality known as the Philadelphia translocation. In fact this was the first cancer chromosome abnormality to be discovered. Imatinib (Glivec/Gleevec/STI-571) was one of the first targeted cancer drugs. Designed to lock onto the molecule produced by the cancer gene, it targets the leukaemia cells containing the Philadelphia chromosome. It’s made a huge improvement to the outlook for CML patients. But for most cancers we’re not so lucky – the cancer-causing genes are not usually so obvious or easy to identify. Most cancers have their own individual combination of genetic errors, and what’s more, the genome changes as the cancer grows more aggressive and spreads. Sequencing of whole cancer genomes could become standard practice in cancer treatment, as a way of understanding each cancer and selecting treatment that targets its specific genetic changes. First we will need to be able to read a complete genome quickly and cheaply. We’re not there yet. But we’re on the way. Compared to 15 years for one representative genome, that’s impressive. Next time: The Human Genome Project was said to be complete in 2003, in time for the 50th anniversary of the discovery of the structure of DNA. Actually it’s still not finished. Most of the gaps are regions that are very relevant to cancer. The first printout of the human genome to be presented as a series of books, displayed in the ‘Medicine Now’ room at the Wellcome Collection, London. The 3.4 billion units of DNA code are transcribed into more than a hundred volumes, each a thousand pages long, in type so small as to be barely legible. From Ross London et al en.wikipedia. This is going to be a blog about research and cancer, but I wanted to set the scene with a little insight into my workplace. Cancer can make people think about questions of life and spirituality. Today I was talking with two people who both lost their spouses to cancer a few years ago. Both had been treated at St Vincent’s Hospital, where I work. These people commented that it’s a special hospital. The staff really care, and there’s a spiritual dimension which really made a difference. The hospital was founded by the Sisters of Charity to serve the poor of Melbourne. It still looks out for the poor and disadvantaged, including patients of modest means. It makes an effort to reach out to the homeless, the outcasts and the mentally ill. It also provides excellent care, being a teaching hospital and part of the University of Melbourne and the Australian Catholic University, and excelling in many areas of clinical research. One thing I like about working at St Vincent’s is “Five Minutes on Friday” – a weekly inspirational message from the Director of Mission. I thought I should share part of this week’s timely offering from Lisa McDonald. and, here’s a curious one… a favourite Church season! Which is a weekly reminder that the people we are trying to help, whether they have a faith or not, are more than just flesh and blood.